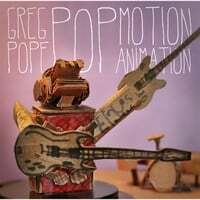 Greg Pope-Pop Motion Animation. It's always a good day when Greg Pope releases an album, as his body of work as both a solo artist and as frontman of Edmund's Crown is some of the very best power pop of the last decade. And while the adage "brevity is the soul of wit" is true, brevity is also the soul of power pop, and Pope never outstays his welcome as the 11 tracks here clock in around 28 minutes and leave you wanting more. The opener "Partner in Crime" might be his best opening track since Popmonster's "Sky Burn Down" with its staccato guitar riffs and crunchy melody, while "More Like You" is 1:44 of breezy guitar pop. Meanwhile, "The Mattress" is a southern-styled power pop stomp that's right out of Terry Anderson's playbook with its imagery of losing a mattress off a truck, "Don't Wait" is an acoustic guitar-propelled mid-tempo gem, and "Cloud and Thunder" is a gentle, lovely near-ballad that shows Pope can pull off the slow numbers as well as the rockers. And one could almost view the Police-influenced "Meanwhile Back at the Office" as a sequel or allusion to his last Edmund's Crown record, Regrets of a Company Man. All in all, The Pope of Power Pop has delivered again. Brendan O'Neill-Outside Worlds. 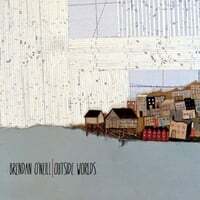 Singer-songwriter Brendan O'Neill debuts with a promising 4-track EP which features the guitar work of site favorite Rich McCulley. Like McCulley, O'Neill specializes in smooth-sounding roots pop/rock, and the four songs here leave you wanting more. "Orchard Girl" sounds like a long-lost hit single from the 90s with its slow buildup and powerful chorus, all augmented by McCulley's slide guitar. "Tic Tac Toe" is a soulful number that makes great use of O'Neill's vocals, while "White Picket Fences" is a Wilco-like mid-tempo gem. The reflective "Workin'" closes the EP in fine fashion, and the best part of all this is O'Neill is offering up the EP as a free download at the CD Baby link below.